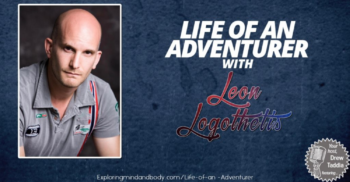 Join Drew Taddia on Exploring Mind and Body this week as he interviews global adventurer, motivational speaker & philanthropist, Leon Logothetis. Leon used to be a broker in the city of London where he felt uninspired and chronically depressed. He gave it all up for a life on the road. This radical life change was inspired by the inspirational movie The Motorcycle Diaries. Leon has visited more than 90 countries and traveled to every continent on the planet! If you need some inspiration, you don’t want to miss out on this one!